This fabric, from a CA designer is so eye-catching and has some interesting and unique characteristics! It is really a two-layer fabric and the layers are sewn together. The upper layer is the jacquard brocade weave that you see in the photo, in a yarn-dyed, dijon-shaded overlapping circle design (18" repeat) (PANTONE 15-1132, 13-0725...ish), and the under-layer is a loosely woven natural mesh weave that gives the fabric more body without stiffness. That layer can be easily removed in areas where you don't need it. Wonderful coloring and pattern, and gorgeous quality! 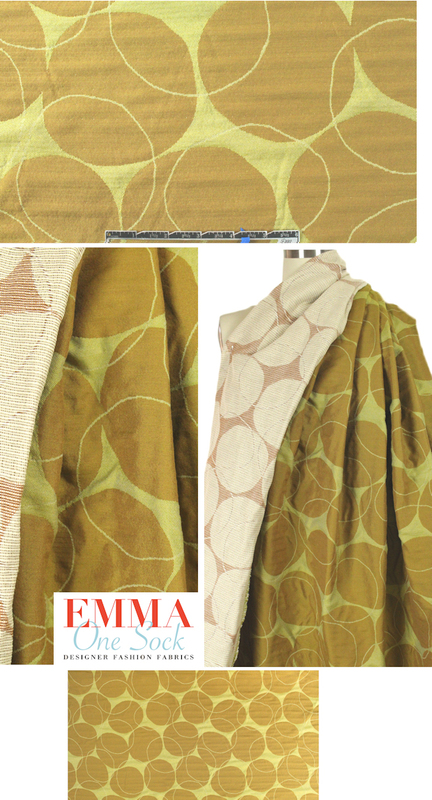 This fabric is perfect for a tailored jacket, a very cool topper coat, long vest, pouffy skirt, sheath or tulip dress, etc. Dry clean only. LAST PIECE, 1.66 yds.